Product information "Glittergel superstar glitter green skin and hair"
Glittergel superstar glitter green fur for skin and hair 15 ml for a splashing effect. Jar of glittergel what with the back of the brush over the make-up can be put for shimmering effects. This multi-colored glitter gel can be used both on the skin and in the hair. Also very nice on the lips! 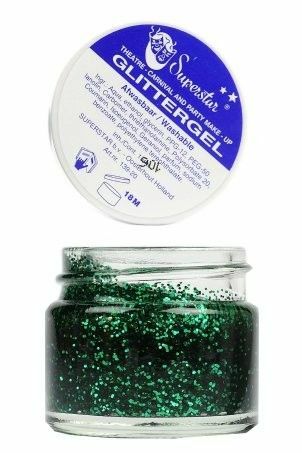 Related links to "Glittergel superstar glitter green skin and hair"
Customer evaluation for "Glittergel superstar glitter green skin and hair"